I Hit the Yidaki Jackpot! UPDATE: Nine of the yiḏaki mentioned below are now listed with demo videos and all the details I have at http://gingerroot.com/catalog/yidaki.htm. Apologies for the lack of recent posts. I’ve been busy in my other role as non-yidaki musician. However, I stumbled upon a treasure trove of yidaki while on tour as a guitarist this past week. 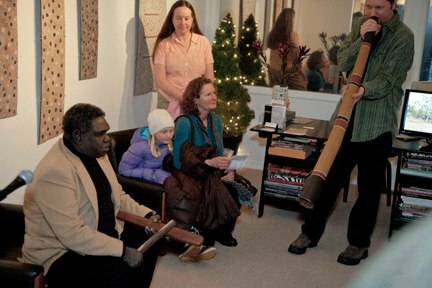 My first full blog post included this pic of me with Wukuṉ Waṉambi at the opening of the Barrku! exhibition at Harvey Art Projects in Ketchum, Idaho back in 2011. I stopped in on the gallery a few hours before my performance in town this Thursday night. 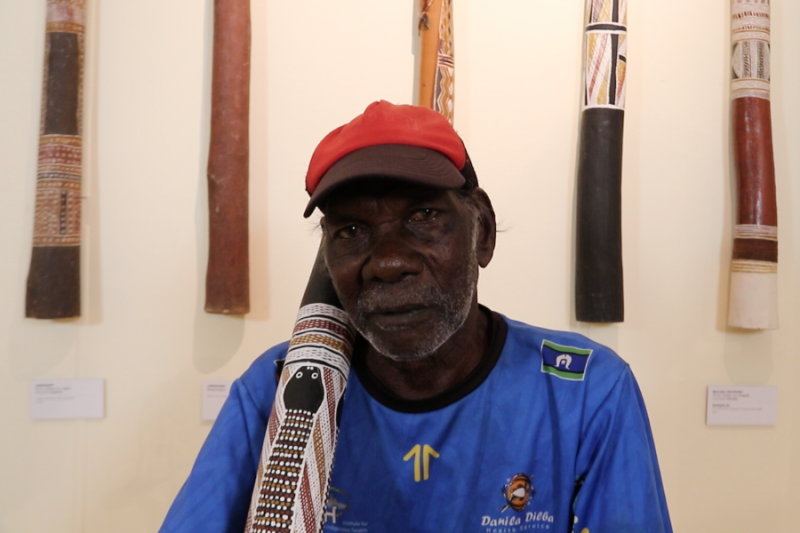 Julie, the owner, shocked me with the revelation that she has thirteen finely painted yidaki sent by my old colleagues in Yirrkala. We pulled them out of storage, admired them for a bit, then recorded quick videos of me trying them all out. We’ll work out how to list them for sale online soon. Up until now, they were for sale to her art collector clients. Now, they will be available to yidaki players around the world. For now, check out these examples. Attention fellow film snobs: I am not responsible for the aspect ratio of the videos. 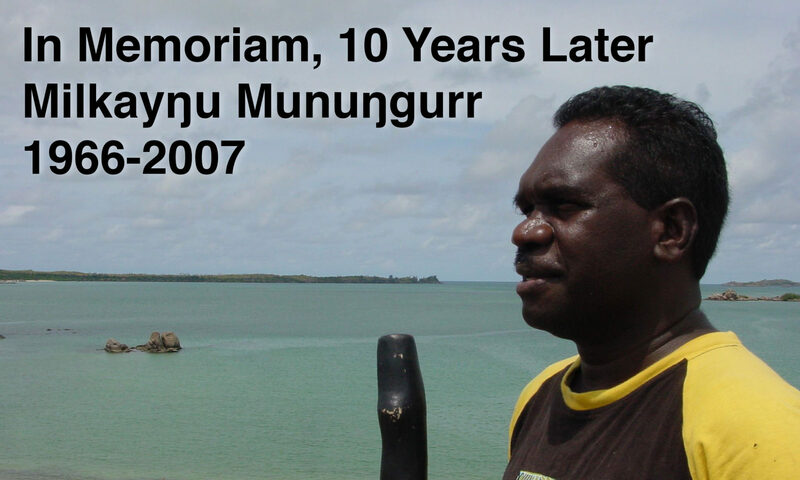 Manini Gumana painted the first one with miny’tji (sacred design) of Yirritja moiety salt water at Garrapara. This one is a great instrument, but is a little awkward to play due to a roughly shaped natural mouthpiece. A little wax or wood filler will easily fix it. 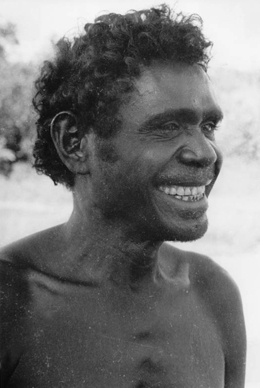 Buwathay Munyarryun adorned this powerful yidaki with Gularri and Djapana miny’tji of his Wangurri clan. Lastly (for now), is a fantastic yidaki with old school playing characteristics, painted in a very fine hand by my friend and former co-worker Marrnyula Munuŋgurr with her Djapu clan’s characteristic square design. I honestly would love to buy all three of these yidaki and a few others in the collection, but simply can’t come up with an excuse to own any more than I do already. Soon I’ll post information on how you can make me extremely jealous by buying them for yourself. Stay tuned! 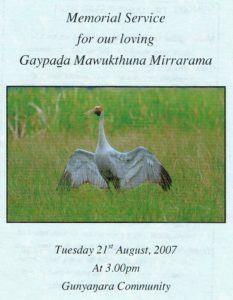 People often ask me about the yiḏaki in my collection. 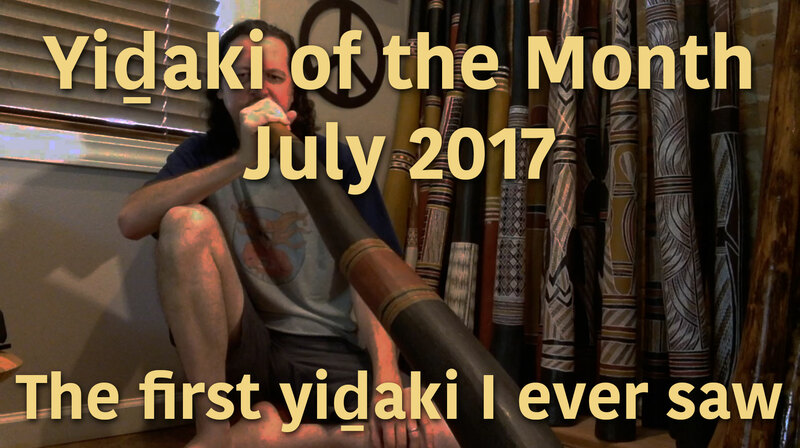 Therefore, I bring you the first YiḏakiStory vlog and the first in a new series: Yiḏaki of the Month. 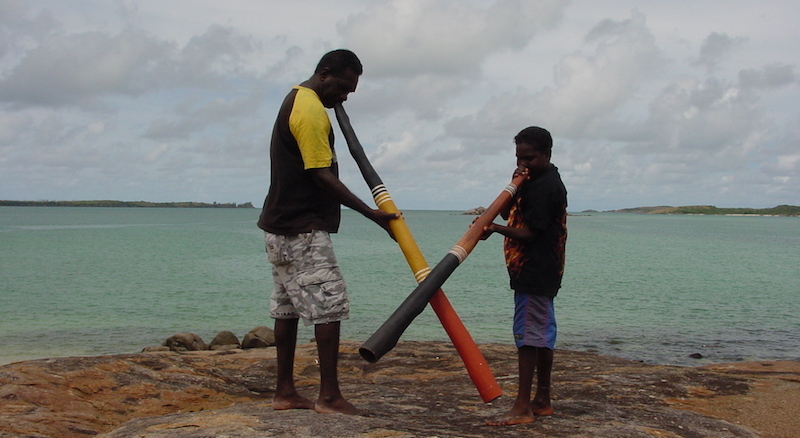 Made circa 1992 by Djakanŋu Yunupiŋu, best known to worldwide yiḏaki players and fans of Yolŋu culture as sister to Mandawuy Yunupiŋu and wife of Baḏikupa Gurruwiwi, Djalu’s father’s younger brother. Deep and warm C#. First owned by the late Mike LeBien, a dear friend and co-founder of my label Ginger Root Records. 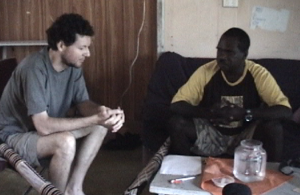 Future editions of Yiḏaki of the Month will feature footage of Yolŋu players on the instrument when I have it. I will record in my studio in the future. I tried to go the easy way and film in my live-sounding living room with an iPad, but clearly I need to capture the sound better. Next time!